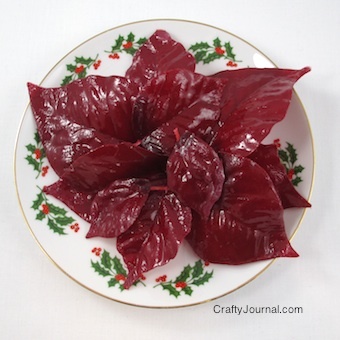 Single use poinsettia soaps make a nice hostess gift, or a gift for someone who frequently has guests. Each leaf has enough soap for a single use, and the disposable leaf will provide a slight scrub. The soaped leaves can be attractively arranged in a Christmas dish to make a pretty decoration for the bathroom. I found these poinsettia rings at the Dollar store. Each one has 12 leaves of various sizes, which is just enough to make a nice little gift. And the glycerin soap chunks can be found at a craft store – use a 40% off coupon for this. Wax Paper to lay dipped leaves on to dry. 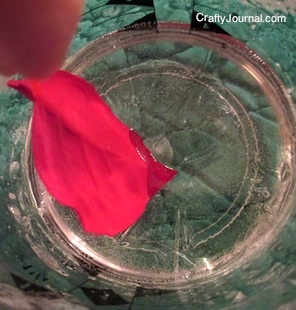 How to Make Single Use Poinsettia Soaps. 1. Cut the individual leaves off the ring, leaving all of the stem attached to the leaf. 2. Put a couple of glycerin soap chunks in the cup and place it in the microwave for about 30 seconds. Microwave an additional 20 seconds at a time until there are just small pieces left. 3. Remove from the microwave and mix until the last bit is melted. Be careful not to over heat the soap. 4. Holding a leaf by the stem, dip it into the soap until all of the leaf is covered. Because the day was cold, I had to work quickly as the soap in the cup started to harden right away. I just kept microwaving it between leaf dips for 7 to 10 seconds to keep it liquid. Lay it on the wax paper to dry. 5. Continue with the other leaves until all are soap covered. After they are completely dry, package them in a colorful Christmas ziplock bag. Or use a regular ziplock bag and attach colorful Christmas stickers. Don’t they look pretty on a Christmas plate! I use a cup that is just for melting soap. I did notice a slightly pink tinge from the poinsettia leaves to the leftover melted soap. Cute idea! I just wanted to pop on over and let you know that I just started a Christmas Stocking Sew-Along and wanted to invite you on over to join in! Hi and wow, these are so pretty and nice. They are perfect for Christmas. I saw it on craft dictator. What a great idea and a wonderful hostess gift! Thanks for sharing how to make this at TTF! Saw this at Redouxinteriors and had to take a look. I’ve never made soap before but I think I can do this! I love this idea, think I will try my hand this weekend. I found your post at Family Fun Friday. What a neat idea! I would have never thought to try something like that! Thanks for sharing! HI I’m KarenLynn from Lil’ Suburban Homestead! I love your soaps they turned out just beautiful! What an amazing unique holiday project! Thanks for linking up to the “From The Farm” blog hop this week! Hi, I am enjoying this wonderful craft and had not thought of this for using soap in the powder room. It is inexpensive and would be great as a give away. Thanks for sharing! What a creative idea! I never would have thought to do something like this, but always love hearing about how to use dollar store products in different ways. This would make a great holiday gift for anyone, especially people who love poinsettias. Plus, it’ll stand out from all their other gift poinsettias! Thanks for linking to the In and Out of the Kitchen Link Party. Hope to see you next week. How clever and pretty! Thanks for sharing! What a fun idea! I love this and can see kids getting a huge kick out of it especially. Wondering if I have time to do this before the holidays. Will pin to remember next year just in case! Thanks so much for sharing it! Could you use real flowers? Or would they wilt under the heat? I haven’t tried it with real flowers. I’m afraid they might mildew as they would stay moist inside the soap. If you decide to experiment, let me know how it works out.